Visual poetry is poetry or art in which the visual arrangement of text, images and symbols is important in conveying the intended effect of the work. It is sometimes referred to as concrete poetry, a term that predates visual poetry, and at one time was synonymous with it. Visual poetry was heavily influenced by Fluxus, which is usually described as being Intermedia. Intermedia work tends to blur the distinctions between different media, and visual poetry blurs the distinction between art and text. Whereas concrete poetry is still recognizable as poetry, being composed of purely typographic elements, visual poetry is generally much less text-dependent. 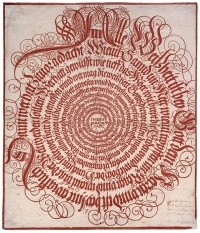 Visual poems incorporate text, but the text may have primarily a visual function. Visual poems often incorporate significant amounts of non-text imagery in addition to text. There remains some debate regarding the distinction between concrete poetry and visual poetry. There are three dominant views regarding the issue. One view is that visual poetry is synonymous with concrete poetry. A second view is that visual poetry is a type (or sub-category) of concrete poetry. And the last view is that visual poetry has evolved into a visual form distinct from concrete poetry. This view is supported by work identified as visual poetry in which typographic elements are secondary to visual elements, are minimal, or in some cases are absent altogether from the work. Unless indicated otherwise, the text in this article is either based on Wikipedia article "Visual poetry" or another language Wikipedia page thereof used under the terms of the GNU Free Documentation License; or on original research by Jahsonic and friends. See Art and Popular Culture's copyright notice. This page was last modified 07:49, 16 June 2014. This page has been accessed 3,027 times.